Though the emphasis at WBC is rightfully on tournaments, our space and days dedicated to Open Gaming continues to expand, along with our Game Library. This year, the 11,771 sq ft Exhibit Hall and 3,774 sq ft Exhibit Annex of the Convention Center will be 100% dedicated to Open Gaming, Demos and the Games Library for the entire nine days of WBC. Together, this space is nearly 20% greater than the Open Gaming location at our previous venue. But the expansion is far greater than that modest figure since so much of the previous space was taken up by the tiered seating and inconvenient nooks and crannies of our previous dinner theatre location. The open spaces of the Exhibit Hall allow us to double the actual table space we had previously. Add to that much improved lighting and newly renovated furnishings and what’s not to like? Scheduled Open Gaming with reserved tables, signage, and schedule inclusion is also available. NOTE: Admission (in the form of a current badge) is required for everyone participating in Open Gaming. So as not to lose track of time, a constantly updated rotating schedule announcing the minutes remaining to the next event starts elsewhere in the Convention Center and adjacent Ski Lodge will be projected from the stage. Attendees in the Open Gaming Area will enjoy free use of the expanded BPA Game Library for use throughout until midnight Saturday. The library signed out more than 1,800 games last year. - The Exhibit Hall is 100% dedicated to Open Gaming, Demos and the WBC Game Library. 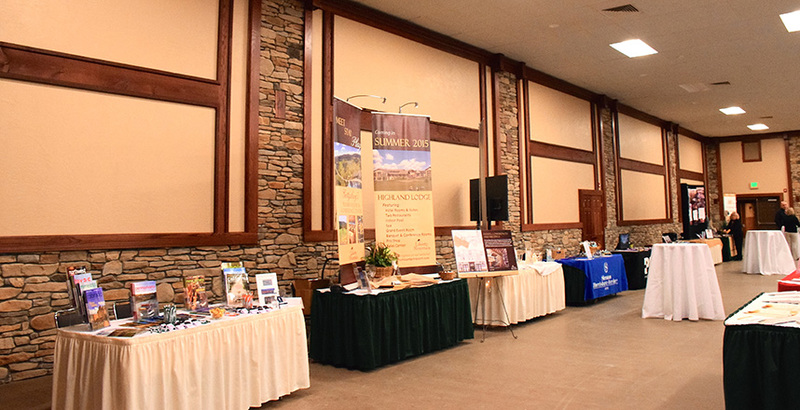 - The Exhibit Hall is available from Saturday Noon, July 23 through 6 pm Sun., July 31st. - A current WBC badge must be worn and visible at all times. - Tables abandoned for more than one hour will be cleared and their contents sent to Lost & Found in Stag Pass. - Tables must be vacated if there is no gaming taking place thereon. - No sales solicitations or commercial signage of any kind are allowed. - The WBC Game Library is available daily from 9 am until midnight, although it will be setup on Saturday evening, the 23rd, and close for packing at Midnight on Saturday, July 30. - Library games are available for free check out and play solely in the Exhibit Hall. - Games appear in approximate Alphabetical order, with numerical titles such as "1989", coming before the letter “A”. The words “A”," The” or “An” at the beginning of a title are ignored. 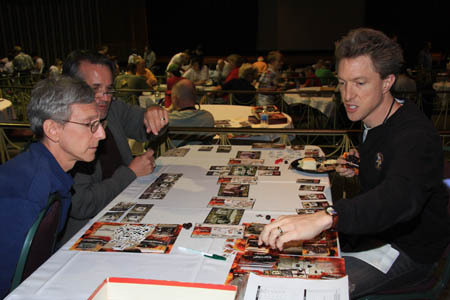 - Expansions are kept inside or with their parent game. - A system of 8 1/2" x 11" alphabetic signs and clipboards assist in locating and returning games. - When the library is closed, it will be covered by tablecloths. Do not remove tablecloths to return or borrow games. - Borrowing a game either for play or inspection of contents is a loan requiring checkout. Loans are limited to one game per person at a time. - Library checkout sheets will be attached to lettered clipboards matching nearby lettered alphabetic signs. - Complete one line on the checkout sheet for a game checkout. No abbreviations. Print legibly. - The midnight return deadline will be strictly enforced on Saturday for inventory and storage of the library. Inventory will start at 11:30 pm and all checkouts will cease at that time. - At midnight, we will require the return of all games. - Monitors with red caps and special badges will be on duty throughout library hours. - Monitors will do room sweeps daily checking for badges. Aid them—and avoid interruption—by wearing your badge. - Hourly sweeps will be made to check for tables that are not in proper use. 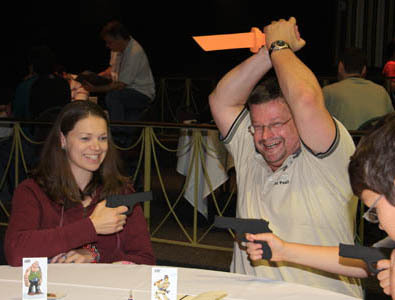 - A “parking ticket” will be issued to any occupied table where gaming is not taking place. If the offense is still present one hour later, the contents will be sent to Lost & Found in Stag Pass. We assume no responsibility for lost or disorganized pieces which have to be moved for this offense.